If you’re asking yourself such a question, you’re likely to be serious about improving your pronunciation so that you sound like a native speaker. If that’s the case, then the first question you want to answer is what kind of native Spanish speaker do you want to be like? What country do you want to sound like you’re from? Do you want to sound like you’re from Argentina? From Mexico? From Spain? Or from someplace else? The answer to this question depends on where you live and the people you’ll be spending your time with when you speak Spanish. It’s important to note that not only does the accent change from country to country. So does the vocabulary. For example in Argentina, Costa Rica and Uruguay, people generally do not use the pronoun tu, they usually use vos. This comes along with a certain way of conjugating the verbs as well. In mainland Spain, people use the pronoun vosotros, while in most other Spanish-speaking regions people use ustedes. Again, these pronouns take on different verb conjugations. Local idioms and vocabulary also differ. We have some articles on Spanish idioms and vocabulary to help you sound more like a native, too, such as posts on body parts in Spanish and Spanish greetings. That means your accent has to be really good, along with your level of fluency. Record your voice and play it back. Compare your recording to a native Spanish speaker. At first start with short words. Then move up to longer words and short sentences. Finally, go to full paragraphs. Work your way up to longer periods of time for your recordings. Start with just a few seconds for each recording. Then go for ten seconds, then twenty, thirty, forty and so forth, until you’ve reached about two minutes per recording. Take note of the common mistakes you make and where you hear an improvement. Consider taking the free course on Udemy called Guide to Pronouncing Spanish like a Native. The focus is on Mexican pronunciation. There are apps where you can record your voice and receive feedback from native speakers. Examples include Hi Native and Hello Talk. There is also a website where you can listen to native speakers to see how they pronounce words and phrases in Spanish. Examples include forvo.com and RhinoSpike.com. With Forvo you can often hear many different ways of pronouncing the same word, depending on where the speaker is from. With RhinoSpike you can submit a request to hear a particular phrase spoken by a native speaker. Track your progress regularly. Keep a record of the recordings you make and the feedback that you get from natives. Note what works and what doesn’t. Which sounds are you struggling with? You may need to work with a native Spanish tutor for special help with your pronunciation. A, E, I, O, U. Practice in front of a mirror. 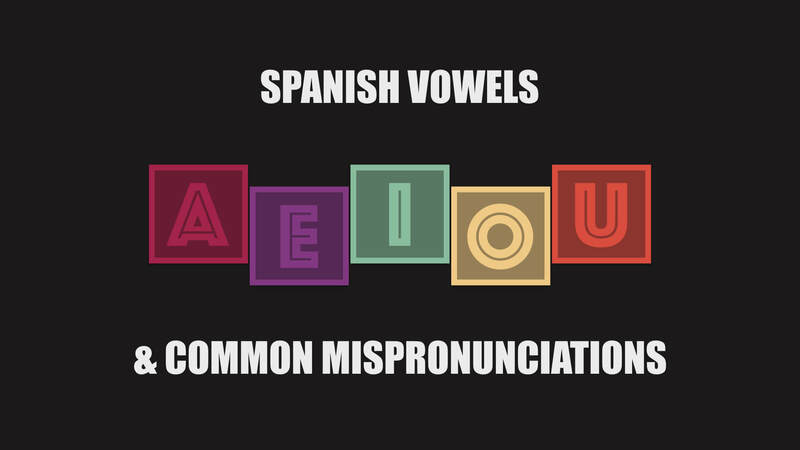 Making the vowel sound correspond to a native Spanish speaker has to do with how you position your mouth. Try to pronounce each vowel in half a second. There is not any irregularity to the vowels. So once you get this down, you’re all set. The consonant sounds can change significantly from region to region and from country to country. You’ve probably learned that the double L in Spanish is considered its own letter. In Spanish dictionaries, it takes up its own position in the dictionary between the letters ‘L’ and ‘M’. Most Spanish speakers would pronounce the double L as a y+ sound. For example llama is pronounced as yama. But in general somebody from Argentina or Uruguay would pronounce it a sh sound. Try saying this sentence in both a standard pronunciation and a Rio de la Plata accent: Un millón de caballos en la calle. In standard Spanish, every letter is pronounced. That’s one of the reasons Spanish is easier to learn than French or Portuguese. When you learn Spanish you don’t have to worry so much about silent letters. However, some native Spanish speakers might not pronounce certain letters. You might find yourself communicating with Spanish speakers from the Caribbean, or from Andalusia or the Canary Islands, and discover examples where they don’t pronounce the letter ’S’. Examples can be found such as buscar, cáscara, fiscalía, where native speakers of Spanish in those regions may make the letter ’S’ disappear. Listen to this 1995 song from the Andalusian group Ketama. It’s called No estamos lokos (notice the unconventional spelling) Listen to how the word buscaré is missing the S.
Check them out on Forvo and you may note that some pronounce the letter V close to the V sound in the English words very and vex, while others pronounce it somewhere between a B and a V. Others still sound much closer to a B sound as in boy and big. When either of these letters is followed by an A, O or U it makes a hard sound. When it is followed by an E or an I, it makes a soft sound. Some examples are casa and cerveza and golfo and gerente. The C in casa is pronounced like a K whereas in cerveza it is pronounced like an S.
Another regional variation is with C and Z. In mainland Spain, these are pronounced with a lisp. So it sounds like the ‘th’ that you hear in the English word thing. In Latin America, the letter Z sounds more like the S in the English word ‘so’. We had a professor from Madrid who was getting the class to try to order a cherry beer in Spanish. Una cerveza de cereja por favor. It’s fun to note that when somebody from Barcelona speaks Spanish, they pronounce their city as Barthelona. When the same person switches to Catalan, the city is Barcelona. The G in golfo is pronounced like the g in gulf, whereas in gerente it is pronounced more like the H in hotel. You can consider the letter H to be silent In Spanish. Take the words hacienda, hecho, hidalgo, hotel, and huésped for example. It’s really the first vowels that Spanish native speakers pronounce when they say these words. The letter J can be similar to the H sound, as in the sound you make when you say the H in the words: has, heat, and hot. In English, the letter P, when at the start of a word, tends to have a puff of air. Try saying the following words in English with your hand in front of your mouth: pan, pen, place, pot, and put. Now see what happens when you try it out with the words: span, spend, splendid, spot, and Sputnik. Notice that when native Spanish speakers have a word that starts with the letter P, they are less likely to have a big puff of air. The P is more like what English speakers have when the letter S comes first and the P comes second, with perhaps even less air, depending on the speaker. Phonetics experts would say the letter P in English is aspirated while in Spanish it is not. Some people find this tricky. With practice, you’ll be able to roll your R’s. The single R is rolled at the beginning of the word. The single R is not rolled when it is between two vowels. For example, there is the word caro and carro. The first word means dear/expensive and the second means car/carriage/cart. So it can be important to learn how to roll your R’s to avoid being misunderstood. You also shouldn’t roll the R when it comes after the letter N.
In Spanish, the letter Q sounds like the English letter K. Just like standard English words, it should also be followed by the letter U. The common Spanish words que and qui are pronounced similarly to the English words cay and key. As we mentioned earlier in this article about, remember to keep your Spanish vowels short: about half a second per vowel. Did you find this Spanish pronunciation guide useful? Share it with a Spanish learning friend!